Mary L. Hartman, 89, formerly of N Milwaukee Street in Port Washington died March 21, 2004 at her daughters N Holden Street residence where she had been residing. On October 26, 1914 she was born to Henry and Louise Schneider Krier in Marshfield, Wisconsin. She married Louis Oscar Hartman of Port Washington at Sacred Heart Catholic Church in Marshfield, WI on April 3, 1937. He preceded her in death May 19, 1979. She worked with Bud and Martha Flierl at the former Avenue Flower shop for many years. She also was a clerk at Lueptows Furniture for many years. 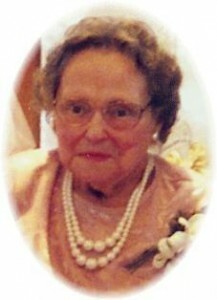 She was a member of St. Mary’s Parish in Port Washington and a former Eagles Club member from 1936 – 1947. Mary enjoyed gardening, yard animals and flower arranging. She was a good cook and potato pancakes. She is survived by her daughter Cele (Dean) Radick of Port Washington and 4 grandchildren, Ericka (Brett) Mitchell of Houston, TX, Adam and Andy Wegner and Jordan Radick all of Port Washington. Further survived by other relatives and friends. She is preceded in death by her husband, a son Alfred L. Hartman, two sisters, Kate Roller and Ann Pierron and brothers Peter, Ed and John Krier.